Written by: Jessica Greenlee on November 1, 2013. Erin Bow is a novelist, poet, and science writer. She lives in Ontario with her writer husband and their daughters. She is the author two Young Adult novels, Plain Kate ( Wood Angel in the UK) and the recently-released (and excellent) Sorrow’s Knot . She also wrote The Mongoose Diaries , a memoir about motherhood; Seal up the Thunder , a book of poems about the Bible; and Ghost Maps: Poems for Carl Hruska , a book of poems honoring a World War II veteran. Bow is currently working on The Children of Peace , a novel for adults, and The Teleportation of Gilbert Perez , a historical fantasy for young adults. She took some time out from her Sorrow’s Knot book tour to talk with Jessica of the Geek Girl Project about her work. Jessica Greenlee: Almost every aspect of power and control in Sorrow’s Knot comes through tying various knots known only to their practitioners. Why knots? What drew you to them as a source of power? Erin Bow: Most of my stories start with a character or two and something I call “the original equipment.” Something a bit more than a premise and a bit less than a plot. Knots were part of the original equipment of Sorrow’s Knot. I don’t feel that I really picked them. Most writers have something that comes to them as a gift, the seed from which the story grows. Characters and their original equipment are the things I get as gifts. 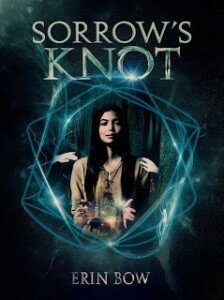 I do know that one of the early and enduring images that drove the creation of Sorrow’s Knot was of a girl with a cat’s cradle spread across her hands — the gesture that ended up on the cover of the book. There was something about that motion, which is both playful and ancient, that caught my imagination. I think it was the contrast between her making what looked like a gesture of power and the fact that her hands were literally tied together. There is something witchy about a cat’s cradle, as there is about many of the ancient games that children play. Also part of the original equipment of the story was the idea that knots bound ghosts. They gave the binders power over life and death. With that came the question: what would it mean for someone to have too much of such a power? The manuscript originally opened with the murder of a too-powerful binder — a scene that didn’t actually end up in the final book. JG: Much of Sorrow’s Knot is about the power of stories. When did you know storytelling was going to be such an important aspect of the novel? EB: After I invented a storyteller. I did that purely for plot reasons: originally the Cricket figure was a teacher, and quite a bit older. But when I scrapped the first version of the story and started again, I wanted a more direct connection to the stories, which are an important part of the mechanics of the plot. I thought the characters would feel closer to the stories if they cared about the storyteller. So I made Cricket a storyteller, and an age-mate of Otter’s. Now he is my absolute favorite character, and the storytelling scenes — especially the first one — are my favorite scenes. Giving a voice to the stories made them central to the novel. By the third revision they were a tight little frame. 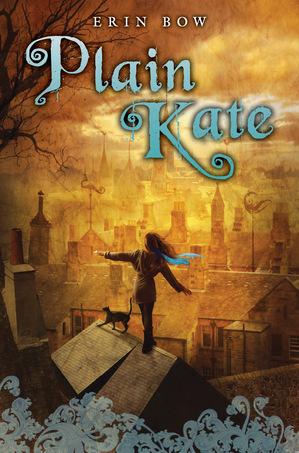 JG: Both Sorrow’s Knot and Plain Kate are set in fantasy worlds that are more rural than our current world and more fantasy in feel. Your upcoming work, The Children of Peace, appears to be set in a world with technology more advanced than our own. Was this a conscious decision to change the pace? EB: It doesn’t change the pace as much as you’d think. Children of Peace is set five hundred years into the future, but it’s also set in a zero-carbon, low-population permaculture world. There are pieces of high technology, but the society has chosen them carefully — to the reader they will stick out like Raybans on a Mennonite. It’s also set at a boarding school that grows its own food, somewhere in the vast sweep of abandoned Saskatchewan — about as rural as life gets. My characters spend most of their time worried about goat reproduction and tomato canning. Well, goats, tomatoes, and getting ritually murdered. I am drawn to the intensity of small groups of people who are stuck together — I think that’s what the “rural” fixation is about. I myself am a city girl. JG: You created entire cultures for both Sorrow’s Knot and Plain Kate. How much detail about customs and habits do you have written out elsewhere? 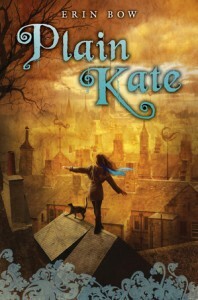 EB: Plain Kate doesn’t have too much backstory that doesn’t appear on the page: it’s a fairytale world with a slightly Eastern Europe flavor — when I had to look things up I pretended it was set on the Polish/Lithunian frontier circa 1600 — but despite the slight exoticism of kopeck coins and zupan coats, this is a pretty familiar world. One can trust fantasy readers to fill in around the edges. The world of Sorrow’s Knot will be less familiar to fantasy readers: there are not so many fantasies flavored by Native American cultures. Accordingly there is more world-building both on the page and in my head. I know things like the names of all the moons, what’s in the bonesetter’s healing teas, and what people are eating all winter. I know several Red Fox stories that didn’t make the page. I know the answer to plot questions like what happened to Moon and Owl and how Orca got to the island in the first place. But it’s not as if there’s the equivalent of The Silmarillion sitting on my shelf. It’s simply that the research was quite a bit more extensive. JG: How did you decide where the stories took place? EB: It’s normally part of the original equipment. But for Sorrow’s Knot, it wasn’t. I met Otter long before I knew much about where she lived. I knew she lived in a whispery, haunted forest, and that seemed good enough — there are lots of those in fantasy. But for some reason the story never quite came together in that generic version of the setting. But then I found the forest. Otter’s world is based on the Black Hills in South Dakota. (Though the caldera is an addition.) The Hills are strange and marvelous. They rise up out of the prairie, black, because of the black pine trees that cover them, full of strangely sculpted stone. The light in the Hills is different, and the air is different. It’s a strange, numinous place, and holy to nearly everyone who’s lived in sight of it. Knowing it was holy, it was with some trepidation that I set the story there. But it felt, the first time I set foot there, as if I’d walked into Otter’s world. JG: How much research did you have to do for Sorrow’s Knot? What is one of the most interesting things you learned? EB: A LOT. Architecture, gardening, ethnobotany, storytelling, drumming, hunting, foraging, stone knapping, rope making — there was a lot. I was trying hard to construct a society that felt whole and reasonable, but didn’t feel European, or modern, or urban — which is my own background. It was not my goal to make the Shadowed People an historically accurate depiction of any particular indigenous people, mostly because when you start with a world where the dead prey on the living and give women (and only women) the power to bind the dead in knots, you don’t end up with an historically accurate anything. But I did try to do better than just gluing some feathers and buffalo to a fantasyland tale, you know? I guess the most interesting thing I learned was about firekeeping — which was a big deal in a time before matches, and remains a big deal in many societies with living memories of that. I was glad to be able to use a little detail about how Kestrel carries a live coal in her pouch by nestling it in wood-ear mushroom and wrapping it in birch bark. It seemed to stand in for all the knowledge Kestrel has that we don’t actually get to see. I designed pine glims myself, based on something I found in the archeological records out of Kentucky. I included them because there were a few places where the plot called for lights you could carry in your hands. I built one. They work. JG: Do you have favorite sources for research? Authors you tend to turn to or places you go? EB: Librarians are my heroes, but once I’ve passed a certain level of rank idiocy, I like the “ask people” method of research. For Sorrow’s Knot, for example, I talked to drummers, wild food foragers, stone knappers, and sacred storytellers. It can be a trick to find an expert, but once I do, I’ve always found people hugely generous. People have taught me to carve wood and ride horses and treat sucking chest wounds — actually, it’s amazing what people will do for you if you tell them it’s for a book. JG: On your website, you describe yourself as a “chewer of pencils.” Do you write any drafts in pencil? EB: I write drafts in fountain pens, type them up — yeah, MacBook! yeah, Scrivener! — and then go over printed copies with a blue colored pencil, which makes a nice soft friendly mark. And, yes, I chew on those pencils. Coffee and chewing on things are my two major vices. JG: You seem to generally be writing three to four books at a time. How do manage that? Do you work on one one day and one the next? Switch when you hit writer’s block? EB: It’s not as bad as it sounds. With fiction, I usually have a book in draft and another in edits, and perhaps one in production somewhere. I switch back and forth according to deadlines — I usually avoid jumping between them within a day or even a week, because fictional worlds take me a bit of time to get in and out of. I also write poetry, which takes up a different space in my mind and doesn’t seem to compete for fiction-writing brain. I normally work on one poem at a time, unless I’m assembling or editing them. But they don’t all go into the same sequence, so in that sense I have more than one book of poetry on the go. JG: Speaking of multiple books, you mention in your blog that The Children of Peace, your current book, “wants to be a trilogy.” How and when did you learn this? EB: Surprisingly late. I was nearly done with the first draft of Children before I had any inkling it was anything other than a stand-alone. Then I wrote this particular scene, and realized — yeah, that’s how they can get of my trap-that-is-a-plot, but it would set up a different problem, a big one, one I’d need a whole other book to deal with. It took me another little bit to realize that, in fact, a whole ‘nother book was an option. JG: With The Children of Peace, you are switching from the third-person point of view in Sorrow’s Knot and Plain Kate to a first-person point of view. Is this tricky? Why the change? EB: I don’t know why I did it. It was in first person when I wrote it down. Original equipment, again. It isn’t too tricky to write in first person — what’s tricky is to STOP sounding like my narrator, Greta, in my day-to-day life. She’s fond of parenthetical clauses and uses good grammar as if her life depended on it. (Not as implausible as it sounds.) I find her semicolons infecting my own voice. JG: You also do science writing. Where would we look to find your articles? EB: I have a gig at the Perimeter Institute for Theoretical Physics, where I write many things and mostly don’t attach my name to them. But we do have a magazine you can read online, or get in the mail: http://perimeterinstitute.ca/node/243. If you follow me on Twitter I link to my more interesting stuff. JG: What do you read for fun? EB: What DON’T I read for fun? I will read the back of shampoo bottles if there’s nothing else in the bathroom. But seriously. I write YA fantasy because it is my favorite thing to read. I read a lot of YA in general, in fact — one of the things I like about YA is that the genre boundaries within it are fluid. I read a lot of contemporary poetry. I like short stories — A.S. Byatt, Alice Munro. I read non-fiction, mostly with a science slant. JG: You mention on your website that you do school and library presentations. Is there a typical subject and format you usually take? I do a bunch of things, but my favorite has been the Stack of Drafts lecture. I always have my manuscripts spiral bound, and the result of the whole manuscript process is a stack of drafts about two feet tall. I go through them with students — just telling them what it’s like to get a story onto paper, and then what it’s like to have to change it to get it RIGHT. What real editing is like. What line editing is like. And then the publishing process: copy edits and first pass pages and ARCs. I try not to make it intimidating — I emphasize the enormous amount of flailing about I did before, you know, publishing a well-regarded book. Teachers love it because they can go: See, revision! I told you so! I think students like a glimpse behind the curtain. JG: Thank you so much for taking the time to answer these questions! EB: And thank you for the gorgeous review!